Cleveland, OH — Rocket Mortgage FieldHouse will open its doors again to welcome fans back for a full season of event activity beginning with Justin Timberlake on October 2nd to kick off a schedule of 17 ticketed events for the month of “Rock’tober at The Q” that includes the start of both the Cleveland Cavaliers and Monsters 2018-19 seasons. While closed for the summer for work on Rocket Mortgage FieldHouse Transformation renovation project to update the nearly 25-year old arena, crews have made significant progress on both the exterior and interior areas of the facility, which includes the start of larger public “neighborhood” and gathering spaces inside Rocket Mortgage FieldHouse that will be under construction throughout the season. When Rocket Mortgage FieldHouse reopens next week, fans will be asked to “pardon our dust” until the arena closes again for the summer of 2019 to complete the renovation. In October 2019, the newly renovated Rocket Mortgage FieldHouse will open for year-round event activity with the start of the Cavaliers and Monsters 2019-20 seasons. To date, the most visible work has been the demolition of the exterior north side of the arena (along Huron Rd. from Ontario St. to E. 6th St.) to make way for the new glass façade and atrium that will add 42,530 square feet of new public space to The Q. The foundation that will support the atrium has been laid and giant steel columns that form the perimeter of the glass wall are currently being installed. The glass installation will begin at the northeast corner and will be ongoing throughout the year. This work will continue to impact vehicle traffic patterns on Huron Rd. and pedestrian flow entering and exiting The Q.
Huron Rd. will remain reduced to two lanes, one eastbound and one westbound during non-event times. During events, both lanes will convert to one-way directional traffic. Prior to every event, beginning at the Ontario St./ Huron Rd. intersection, the two lanes will be ingress only onto Huron Rd. traveling east-bound toward the Gateway East Garage/Prospect and E. 9th St.
At the conclusion of every event, the two lanes will be dedicated to west-bound traffic only. Vehicles departing the Gateway East Garage at the Huron Rd. exit will only be permitted to exit left onto Huron Rd. going west-bound. The Cleveland Police will work to efficiently manage traffic flow during ingress and egress for events and will exercise judgement to change traffic patterns as necessary to facilitate a continuous flow of vehicles. Fans should expect delays, prepare accordingly, and are urged to arrive early and allow extra time for parking and entering the arena. It is strongly encouraged to car pool, use RTA, or Lyft to the arena. Limited parking in the Gateway East Garage is available for Cavaliers and Monsters games and all arena events during the 2018-19 season. Pre-paid Gateway East Garage parking is available for purchase at TheQArena.com on each specific event page. For additional parking options in the Gateway District, visit TheQTransformation.com. *Parking will be Passes Only in the Gateway East Garage when concurrent events are taking place at both Rocket Mortgage FieldHouse and Progressive Field. Fans attending events have multiple options to enter and exit the arena as they navigate zoned off construction areas. Outside The Q, along with wayfinding signage to direct fans to entrances, Rocket Mortgage FieldHouse’s easily identifiable guest services representatives will be stationed to assist those coming to the arena. During events, there are six (6) entrances for fans to access The Q. All entrances are ADA accessible except for the NW Ceremonial Entrance, which due to construction is temporarily not accessible for fans in wheelchairs or those who cannot negotiate steps. RTA Walkway Entrance – Located on west side of Rocket Mortgage FieldHouse facing Ontario St. can be accessed street level or by those using the RTA Walkway. This entrance is also an ADA drop off location. North Arcade Huron Rd. Entrance – Located on the northeast side of Rocket Mortgage FieldHouse and can be accessed via crosswalk on Huron Rd. A wheelchair ramp is constructed for this entrance. Gateway East Garage Bridge – Can be accessed off Level 3 of the garage elevators. South East Entrance – Newly created temporary entrance located on the east side of Rocket Mortgage FieldHouse past the Cavaliers Team Shop. South Entrance – Located across from Gateway Plaza facing Progressive Field. Entering Rocket Mortgage FieldHouse on Non-Event Days. On non-event days, the only entrance that will be open to enter Rocket Mortgage FieldHouse is through the RTA Walkway Ontario Street Entrance doors located on the west side of the arena. The public will be able to visit the temporary Main Box Office, now located at the NW Ceremonial Entrance, via the Walkway doors during regular business hours 9:30 a.m.-6:00 p.m. Monday-Friday. 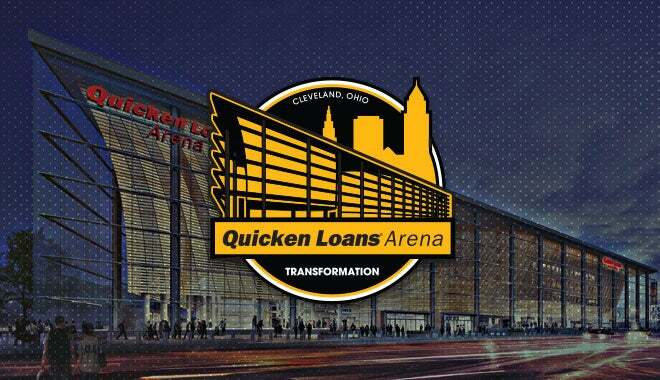 During the Transformation project, doors for Cavs games will open TWO hours before tipoff. Doors will open 90 minutes prior to the start of Cleveland Monsters games. For the most updated information and door times for concerts and other events, visit TheQarena.com. The RTA Walkway that connects Tower City and Rocket Mortgage FieldHouse will be open for all arena events. The RTA Walkway provides easy access to the arena for fans riding RTA’s rail and bus service to Public Square. The enclosed walkway protects from both weather and traffic. The walkway begins at the Tower City Center food court and ends in the lobby of Rocket Mortgage FieldHouse. For Cleveland Cavaliers games, the RTA Walkway will open four hours prior to the game and remain open for three hours after the game ends. The RTA Walkway opens three hours prior to the start of other arena events and remains open for approximately three hours after the event ends. Rocket Mortgage FieldHouse Main Box Office, located on the northeast side of Rocket Mortgage FieldHouse inside the Arcade Entrance, will be part of the construction zone throughout the 2018-19 season and will not be operational. A temporary Main Box Office inside Rocket Mortgage FieldHouse is located inside the northwest Ceremonial Entrance and will be open during regular business hours, Monday-Friday, 9:30 a.m. – 6:00 p.m., Saturday 9:30 a.m. – 5:00 p.m., and during all events. The box office will open at noon on Sundays for all scheduled events, otherwise it will be closed on Sunday. On non-event days, fans can visit the Main Box Office via the RTA Walkway Entrance Ontario Street doors located on the west side of the arena. Two auxiliary Box Office trailers will be set up outside Rocket Mortgage FieldHouse to service fans during events, one on the north side of the arena outside the NE Arcade Entrance, and the second stationed on the south side of the arena near Gateway Plaza. Closed since mid-August due to construction taking place around its E.6th Street storefront, the Cavaliers Team Shop will open its doors once again on October 2nd. Fans can shop for the latest Cavaliers and Monsters merchandise during regular business hours, Monday-Saturday 10:00 a.m. -5:00 p.m. and during all home games. The Team Shop is closed on Sunday. While construction will cause temporary inconveniences during the 2018-19 season, the Cavaliers and Rocket Mortgage FieldHouse organization is committed to providing a seamless fan experience and a high-level of customer service for those attending events throughout the renovation project. Construction on the new public hospitality area located at the south end of Rocket Mortgage FieldHouse upper level in Loudville presented by FirstEnergy is underway and will be completed for the start of the 2019-20 season. This exciting new space will feature new seating and standing room views of the court, as well as a central bar for fans to gather. As a result, sections 216, 217 and 218 are being removed from the arena’s seating configuration on the upper level. Even though the adjacent concourse span between those sections will be a marked-off construction zone during the 2018-19 season, a passageway will allow for 360-degree pedestrian flow around the concourse. With the removal of these seating areas, The Q’s capacity for Cavaliers is changing from 20,562 to 19,432. The original concourse flooring throughout the main and upper concourses is in the process of being replaced. The upper level flooring is nearly complete, while the existing surface on the main concourse has been removed and covered with temporary paint. This will be a work in progress throughout the season. For the start of the 2018-19 season, work will continue on building a more expansive and modernized south entrance along with the new “South Neighborhood.” Both are on track to be completed by early 2019. For the most updated information on Rocket Mortgage FieldHouse Transformation process, visit TheQTransformation.com.